Trav and I returned from New York Saturday night and my legs and feet are still tired. We walked and walked and walked. And ate and ate and ate. In my opinion, the food in NYC is always the #2 highlight of our trips (shopping is #1, just in case you’re wondering). Thursday night we ate at an adorable little seafood restaurant in Greenwich Village called Pearl Oyster Bar. It was a quintessential NY eatery…super small, yet cozy, and serving up fabulous food. For appetizers we had their Clam Chowder and the Mussels. Both were delish. For my entree I had a Lobster Roll that I’m sure was sent straight down from Heaven’s kitchen. Afterward we went for a nice late night walk, then took a cab to Rockefeller Center. Although, this was my fourth trip to NYC, we have never hit up any of the traditional tourist spots for some reason. We decided it was high time for us to do just that and went to see the city from up above. We went to the top of 30 Rock and were in awe at the view. We heard the view from 30 Rock is better than that of the Empire State Building and I now understand why. If you’re on the Empire State Building, you can’t see it. But from 30 Rock, you have a fabulous view of the ESB and it was, by far, the most beautiful of all the buildings. The next morning we shopped and I discovered my new favorite store, ABC Home. Holy cow, this place is amazing. It’s like Anthropologie Home on steroids. Lots and lots of steroids. Seven stories worth of steroids. I was in home decor heaven. We spent the afternoon hanging out in Central Park. Reading. People watching. Making-out. Kidding, kidding. Trav’s not into the whole PDA bit. He would rather eat a bowl full of mayonnaise with a side of sour cream and cottage cheese for dessert than make-out in public. I’m really not into it, either, but I just like to see him squirm as I act like I’m ready to mug down on the subway. That evening we decided to eat at Bobby Flay’s Mesa Grill. We ate brunch there once and loved it, so we decided we should give dinner a try. It’s a good thing we did because the food was to die for and we ended up having two celebrity sightings, which always makes for a good time. We scored a great table back by the kitchen and were chatting away when I looked up and realized Bobby Flay himself was standing about three tables away from us. He was all decked out in his chef gear and was super-duper nice to the peeps asking him for pics. Since he was being so nice about it, I asked Trav to get his Blackberry out and take a pic of Bobby and me. Any of you that know Trav, know that Trav said no. He’s just not the kind of person that likes to bother people. He’s not shameless like me. “Do it for Momdiggity!! !” I begged. He reluctantly agreed. Pardon the poor quality of the pic…it was the one night I left my camera at the hotel. As excited as I was about Bobby, our other celeb sighting may have taken the cake. I looked over and agreed, but couldn’t put my finger on it. It wasn’t registering with me. I immediately started laughing. It was definitely him. Such a random sighting, but fun at the same time. The whole trip was fabulous. The only reason I was able to go is because Trav went for work, therefore his flight, food, and our hotel room were all paid for. My flight was also free because we had a flight voucher. My mom was sweet enough to fly to KC and keep Arle for us. The whole thing worked out just perfectly and I’m so thankful we were able to have a nice little getaway. And that I didn’t fall flat on my face in the middle of Penn Station. Oh that sounds like so much fun! And I actually giggled out loud when you wrote about Travis and the no PDA, not bothering people, etc. That is so the Travis I know and love. Sounds like you had a blast!!! I am so glad you got a little fun couples trip to NYC! I want to look at that blog about the neat home store! I bet Arle was more spoiled than ever when you got home!!! Sounds like you had some yummy food! Glad you are home safe and sound! Hugs to Arle!!!! I still maintain that the Prince Humperdink sighting was much more than minor. I would have killed to get a pic with him and have him quote some lines! 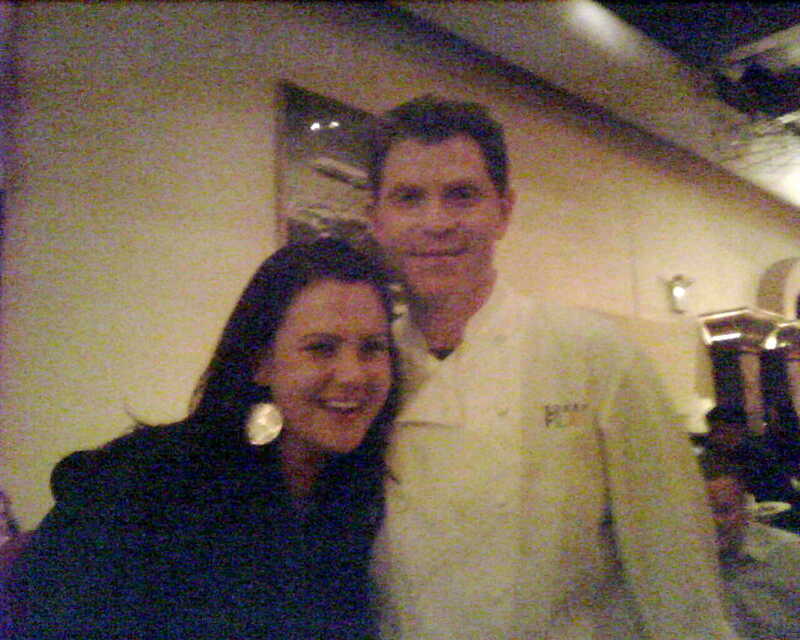 I think Bobby Flay might be my celebrity crush. Which is good, b/c he looks a bit like someone else I know… BUT HE COOKS! ;) I’m glad that you had a great time in NYC. I’m thinking about a trip to Dallas in July want to meet up? oh my gosh, that is sooooooooo cool you saw them! sounds like a fun trip. i must go! travis, quit being a fun killer. make out with your wife! take pics of celebrities! eat creamy sauces! live a little. haha. You saw Chris Sarandon? Nice! your trip sounds fabulous. you’ve totally got me craving a fun trip with mat. and cocktails. and yummy food. and shopping. glad you had a great time! Josh is anti-PDA as well, too cool to bug people. So glad you got to go! On a side note, Tulsa is getting an Anthropologie. They are taking over the old Harolds space @ Utica. You can’t imagine how happy I am. Now if only we could get an H&M & a Nordstroms.